bone bruise or plantar fasciitis? Yes, believe it or not, you can get plantar fasciitis from trauma. The plantarfascial ligament acts as a "bow string" that attaches from your heel to the ball of the foot. The purpose of this ligament is to maintain the congruity of the arch. Whether you aggravate it by doing a lot of walking and thus overstretching it or by hitting part of it on top of a paint can, either event can do damage to the ligament itself. You have had various tests performed but do not mention an MRI. Additionally, you fail to mention what treatment has been rendered to you. It would help if I knew what has been done to your left foot in an effort to improve it. Since you have been to three different doctors I will make the assumption one or all three of them offered you some sort of treatment. Treatment would have consisted of possibly oral anti-inflammatory medication, possibly a cortisone injection, strapping of the heel, or perhaps an orthotic to support the plantar fascial ligament. Going further, physical therapy is very helpful. In very severe cases wearing a cam walker (walking cast) or even going non-weightbearing on crutches is also an option in many cases. In addition there is another aspect of your injury that has to be entertained. That is a bone bruise on the bottom of the heel, just behind where the plantarfascial ligament attaches into the heel bone. Additional causes of pain generally less common in these cases of trauma, would also include irritation of Baxter's nerve, which is a nerve that passes on the bottom of the heel and it too could have been irritated from the trauma. Lastly, a heel bursitis may have flared up from the trauma as well. 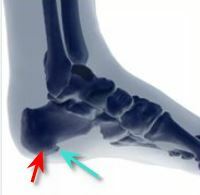 If you look at the diagram that I have provided, the blue arrow would represent the area that might be affected by irritation or tear to the plantarfascial ligament. The red arrow which as you can see is just slightly behind the blue arrow would represent a bone bruise. You do not mention if you were wearing shoes or not when you had your accident, but if you have a foot structure where there is not much fat under the heel, then when you landed on the paint can, your heel bone may have hit in a certain angle to bruise the bone. If you had fractured the bone, even a small fracture, the bone scan would have probably picked that up, even if the x-ray did not. This is not a scientific method but if you press right on the bone on the bottom of your heel and you get pain, it may very well be a bone bruise. If you move your finger forward just slightly and press on the heel, but you feel like you are pressing on soft tissue (plantarfascial ligament) and there is pain then you probably have at the least, plantar fasciitis, at the worst, a partially torn ligament. Since I do not know what treatment you have had at this point it is hard for me to make any recommendations. I have given you a list of things that can be done for heel pain. I would suggest you go back to the doctor that seemed the most knowledgeable (hopefully he is a foot specialist) and discuss your options with he or she. Thank you for your time, your very much in detail response! You have given me more than 3 doctors have since November. You asked why no MRI - I have a interstem for bladder control, which makes me unable to have the MRI. No doctors have even mentioned therapy, splint, nothing. At this point I wrap my foot with padding about 4 inches thick then with an ace bandage to keep it there just to cushion the pain.... I have an appointment with my general doctor tomorrow and I will be demanding something to be done because living in this pain, besides the other daily pain I live thru is unbearable and when I self medicate myself to deal with life and sleep away the day just to feel no pain is no way to live.